The weekend before last I attended the National Entrepreneurs Convention at the ICC in Birmingham and had one of those genuinely awe-inspiring “don’t-come-round-very-often” experiences. 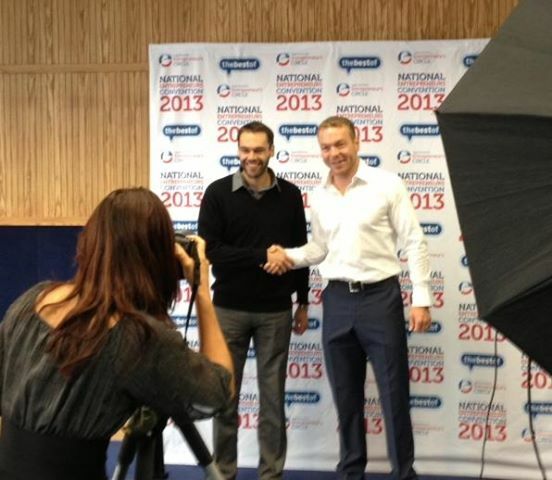 Sir Chris Hoy, the most decorated British Olympian in history, was the guest speaker and I was transfixed! This guy has made me shout, jump, sweat, scream and even well up a little (I’m not too proud to confess!) on more than one occasion as I’ve watched the Olympics and cheered him on to victory as if it was actually me winning that gold! Sir Chris shared the story of when he was 15 and his coach asked the club he was part of to go away and think about what the big goal was for each of them. Chris wasn’t even the best in that group of fellow young cyclists at the time, but he was the only one who came back and said he wanted to win Olympic Gold. The rest, as they say…. A little time, a little thought, a little ink on some paper used answering this question has really helped me a lot. I hope it does you too. This entry was posted on Tuesday, October 8th, 2013 at 12:25 pm and is filed under General. You can follow any responses to this entry through the RSS 2.0 feed. You can leave a response, or trackback from your own site.